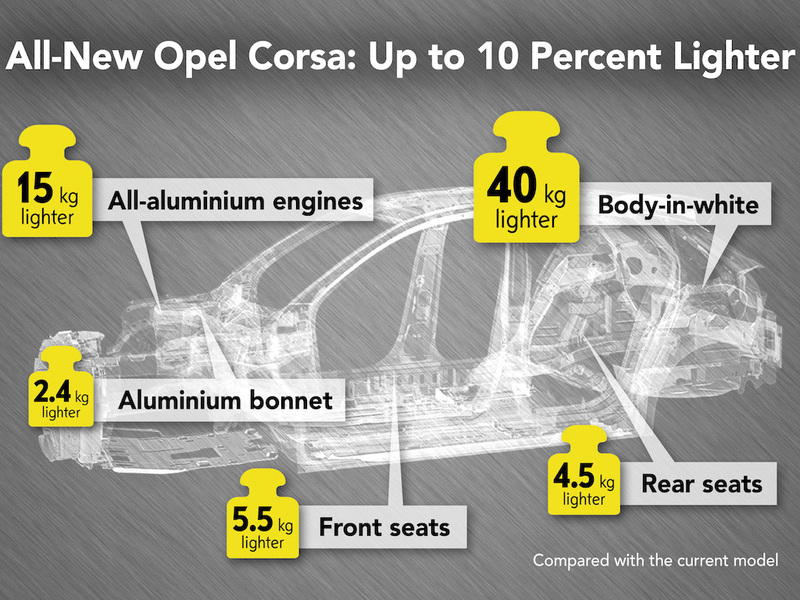 Vauxhall/Opel’s sixth-generation Corsa will offer a considerable reduction in fuel consumption and CO2 emissions; the result of a drastic weight loss as well as enhanced aerodynamics and powertrains. Due to launch this summer with the fully electric model due in 2020, the new model will feature a lightweight design weighing in from 980kg – up to 108kg less than the outgoing model – despite retaining similar dimensions. Based on PSA’s CMP shared platform for small and compact cars that’s also being used for the new Peugeot 208 and the DS3 Crossback, the new Corsa has achieved its weight loss through the use of high-strength and ultra-high-strength steels, as well as an aluminium bonnet, new lighter weight seats and all-aluminium construction for the petrol and diesel engines. These include compact three-cylinder petrol engines that weigh around 15kg less than the previous generation of similar power four-cylinder units, although full engine details are yet to be revealed. The electric Corsa is one of four Vauxhall/Opel ‘electrified’ models due on the market by 2020, also including the Grandland X PHEV, as the brand draws upon PSA’s electric drivetrain, as announced more than a year ago, post-PSA takeover in Vauxhall turnaround plans. 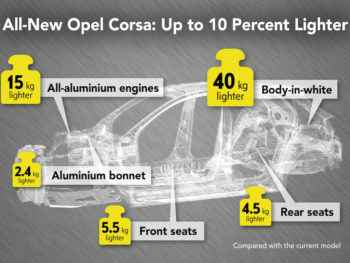 Vauxhall/Opel is also yet to reveal the Corsa’s styling but a recent teaser revealed the car’s IntelliLux LED headlights. Previously seen on Astra and Insignia and billed as a segment first for a supermini, these automatically and continuously adapt the illuminated area in line with traffic conditions to ensure other drivers aren’t dazzled.